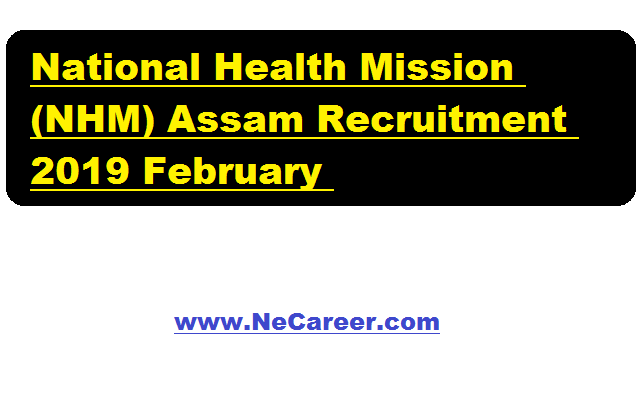 National Health Mission (NHM) Assam Recruitment 2019 February :- We welcome all seekers at North East India's No. 1 Job Portal NeCareer.com . National Health Mission Assam has issued a job notification in the month of February 2019 for filling up various posts. Online applications are invited from the eligible candidates willing to work in mission mode with challenging tasks for engagement on contractual basis for the following position @ National Health Mission (NHM), Assam. Interested and eligible Candidates have to apply online in the NHM, Assam website: https://nhm.assam.gov.in . Online application will be received till 16th February 2019. The aspiring candidates shall visit the NHM Assam website to check the updates.